Week 4 of the NFL season is here, and that means another week of "Love 'Em Leave 'Em." I'll be the first to admit I didn't do incredibly well last week. I'm looking at you, Cam Newton. There were more injuries in week 3, with guys like Doug Baldwin and Jordan Reed having unknown statuses and playing in late games this week. How annoying. We did get more consistency last week, though, with guys like Le'Veon Bell and Michael Thomas having big games. Let's take a look at week 4 now. Love 'Em: Andy Dalton @ CLE - Yep, I'm going to be the guy who overreacts to one week. In new offensive coordinator Bill Lazor's first game in Cincinnati, Andy Dalton looked very strong, completing 21/27 passes for a pair of scores. They're featuring Joe Mixon now, who is easily the most talented back on their roster. Now, Dalton gets to play Cleveland, who have allowed multiple touchdown passes in every game this year and just got torched by Jacoby Brissett. You might be skeptical about starting Dalton after his miserable start to the season, but I trust him. Leave 'Em: Cam Newton @ NE - Something is clearly not right with Cam Newton. Andrew Luck is expected to be out until November, and maybe Cam should've sat out too. He's not hitting anybody, ever. Last week, Christian McCaffrey was 2 yards away from Cam in the end zone and Newton through it 15 feet above his head. He's played some of the worst defenses in the league early on in the year and just has not been good. Don't expect anything different this week against the Patriots. 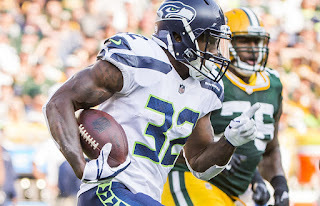 Love 'Em: Chris Carson vs. IND - After many different hype trains and scenarios, it looks like the Seattle Seahawks finally have a lead back. Not Eddie Lacy, not Thomas Rawls, but Chris Carson. Carson was picked in the seventh round of the 2017 draft, but looks great early and is averaging almost 4.5 yards per attempt. He found the end zone against a tough Tennessee defense last week and will steamroll the terrible Indy defense. Leave 'Em: Marshawn Lynch @ DEN - Early on in the year, it looks like I was right about Marshawn Lynch. He's doing fine with the carries he is given, but just isn't getting the ball too much. It's clear that the Raiders want to save him for the end of the year, which is the smart move as an organization. This week, he faces a Denver defense who absolutely shut down Ezekiel Elliott and LeSean McCoy. There's a long list of guys I'm starting before I start Beast Mode tomorrow. Love 'Em: Larry Fitzgerald vs ARI - If you thought Larry Fitzgerald was washed up, you were proved completely wrong Monday night. He caught 13 passes for 149 yards and a score! This week, he faces an even worse defense, the San Francisco 49ers. Last Thursday, SF let the Rams have not one, but two wide receivers eclipse 100 yards for the night. Larry Fitz is going to feast. Leave 'Em: Amari Cooper @ DEN - We'll continue with the Oakland Raiders theme here. I own Amari Cooper in a lot of leagues, and I'm sitting him in every single one. The most yards Cooper has ever had against Denver is 56, and somehow the Broncos defense looks even better this year. Amari went 1-6 last week and is struggling badly with drops, and coach Jack Del Rio has acknowledged it. Really Amari's only chance of production comes through a touchdown, and Oakland doesn't use him inside the 20. Love 'Em: Austin Seferian-Jenkins vs JAC - ASJ time! Austin Seferian-Jenkins made his season debut Sunday, catching 5 receptions for 31 yards. This week he plays Jacksonville, who've given up the 9th most fantasy points to tight ends this year. They have a really strong secondary so they will lock down the receivers, making it hard for Josh McCown to find them. ASJ also has huge play upside and could capitalize on garbage time tomorrow. Leave 'Em: Jordan Reed @ KC - No, this is not a knock on the talent of Jordan Reed. However, he has about 50/50 shot of playing Monday night, and unless you have Vernon Davis, you will have no other choice if he does indeed sit. Plus, Kansas City is certainly not an easy matchup so I'd prefer not to take the risk and just leave Jordan on the bench.